The rainbow jersey has begun to enjoy his precious garment in the historic Milano-Torino. This a race disputed since 1876 and that this year fulfilled its 99th edition. 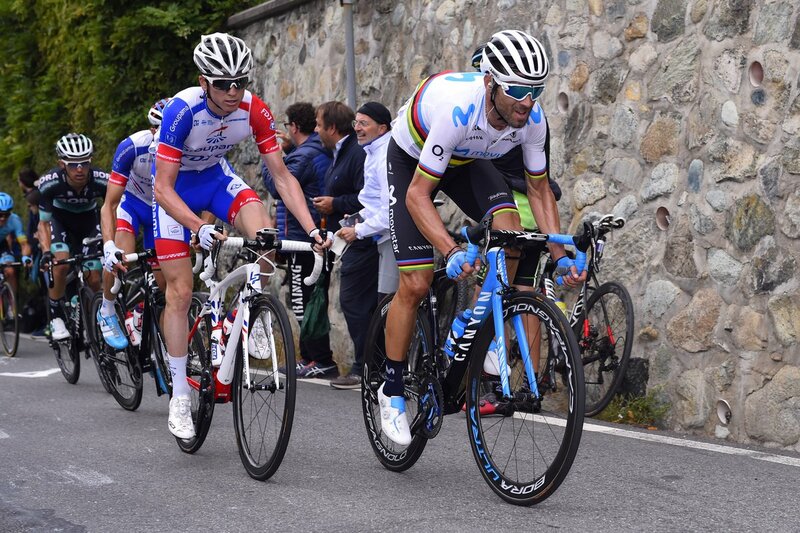 After the debut in Tre Valli Varesine the day before, Valverde was offensive in the first of the two Superga climbs, the key point of this competition. Valverde attacked twice, reaching the top with the French Thibaut Pinot and David Gaudu (Groupama FDJ) and the Polish Rafal Majka (Bora – Hansgrohe). The group increased in the descent and was broken again in the definitive ascension to this basilica on the outskirts of Turin. The new world champion fought again among the best in the final kilometers, until the attack of Pinot, after a fall of Gaudu and Miguel Angel Lopez. Valverde finished in an outstanding third position, a few seconds later than Thibaut Pinot, having fun on an excellent cycling course. His next stop will be a Monument like Il Lombardía. Statements: Im very happy to be on the podium of Milan-Turin. I knew that winning would be very difficult and, as in the first climb I was very well, I wanted to break the race and enjoy. If I had really wanted to bet to win the race I should have saved more, but I came here today to have fun and offer a show. It gives me confidence to look like this. We will try to make a good Il Lombardia; winning is never easy, it will be a tough race with top-level rivals, but the legs have been good today and I hope they will be this way on Saturday.